To advance through the bracket, teams have two options. Option 1 is to play the game (two 20-minute halves, 2’s and 3’s, clock stops last two minutes, common fouls in last two minutes are 1-and-1). With geography part of the bracketing process and conference tournaments taking place this week, the hope is several games can take place. Option 2 is determining the winner 50% by expected score of the game at a neutral site (by KPI) and 50% by fan vote. This allows for a team’s performance to be quantified as well as for managers to help generate fan votes for their school and managers. 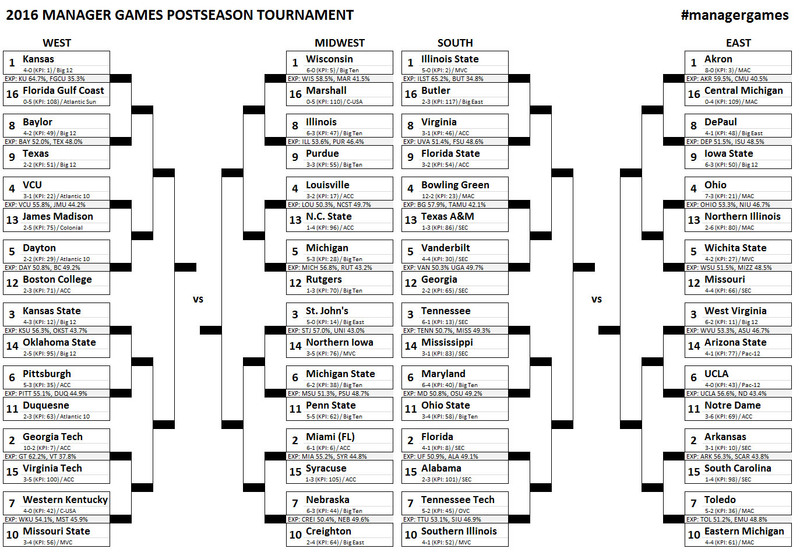 The expected score of the game (and hence 50% of the vote) is listed on the bracket for each matchup. Twitter polls will be used to determine the 50% fan vote and are going live with the bracket release on Sunday night. Voting for the first round will run through Wednesday, March 9 at 11:59 p.m. ET. Voting and deadlines for future rounds will be announced as the tournament continues (note the change from the original date posted in February).